What foods did you love as a child? It's amazing how one bite can whisk you away to memories that you thought you forgot. One of my favorites was peanut butter and jelly sandwiches. If you ask me, creamy peanut butter was the way to go! I love making them now for my own children, hoping that this classic combination will remind them of their mother's love in the years to come. I wanted to make this delicious peanut butter and jelly combo something that was a bit elevated and maybe enjoyed in a new way. 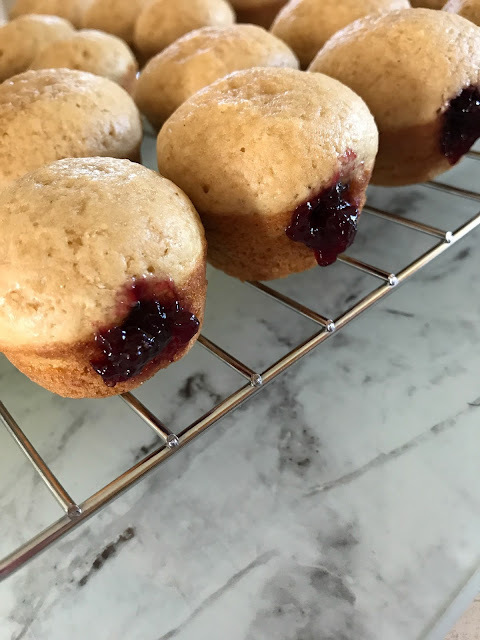 I came up with a mini peanut butter muffin that is filled to the brim with jelly and dunked in a delicious peanut butter glaze. Get that glass of milk ready, because these bites are heavenly and rich. A slightly indulgent way to start your day off with a smile. These muffins are made using a mini-muffin pan and it makes about 36. You don't want to fill your tins to the brim, try to aim for 3/4 full. 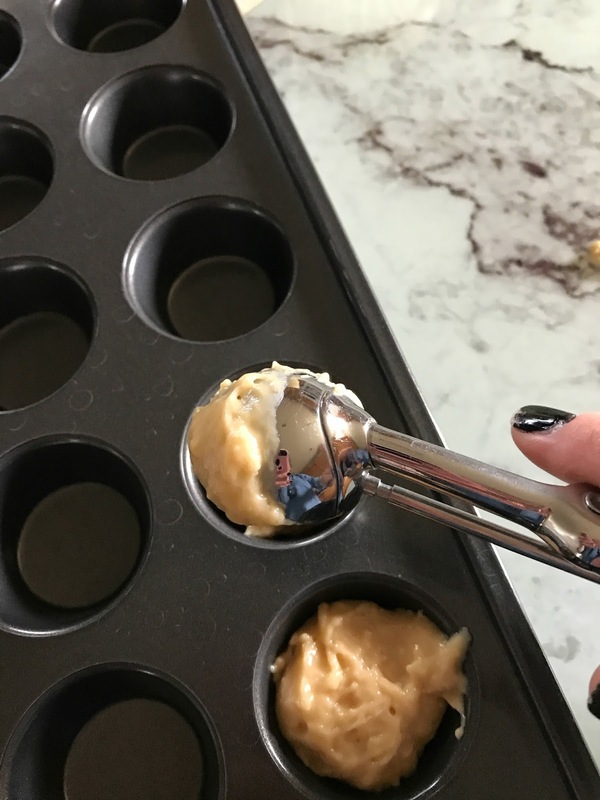 I found this small cookie scooper was just perfect to grab and fill the muffins. The dough rises quite a bit! Mmm! A quick bake in the oven for only 10 minutes, you will be amazed by how fast these come together. Look how big and puffy beautiful they are! I fill them up from side to side with my homemade jelly. Don't you just want to eat a few dozen? And it's awesome that they are mini, easy to place in a napkin and eat while you sail out the door. These sweet bites of childhood are the perfect and easy breakfast you need in your life. 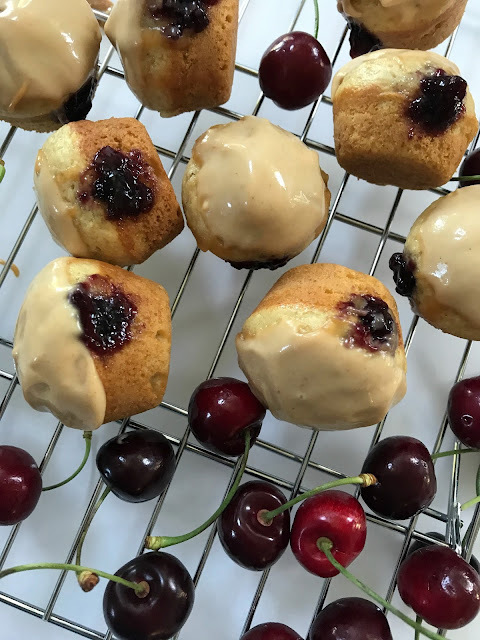 Mini muffins dipped in a peanut butter glaze and chock full of jelly. 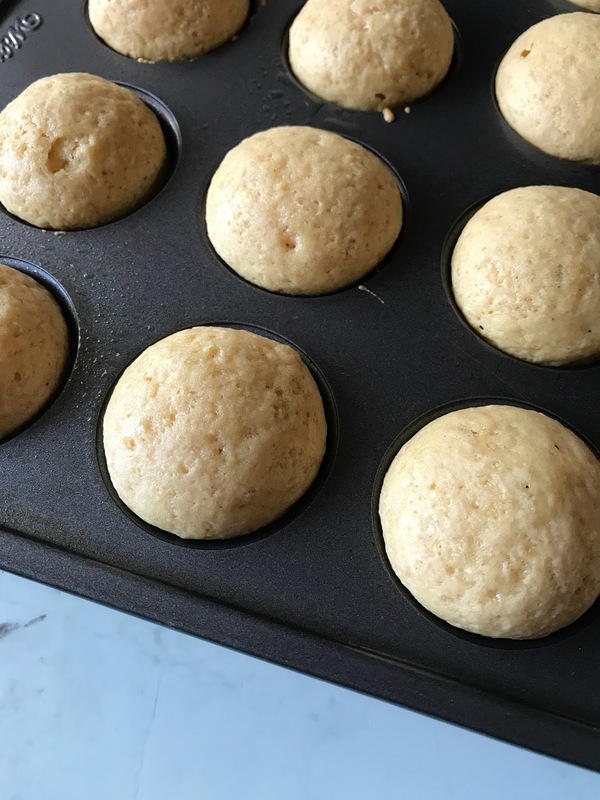 Preheat oven to 350 F and prepare a mini muffin pan with spray oil. In a medium bowl combine flour, sugar, baking soda, baking powder, salt and peanut butter powder. In a separate smaller bowl, beat eggs, milk, vanilla and butter. Gently combine the wet to the dry ingredients and mix until well combined, but don't over beat. Fill the muffin tins about 2/3 full and bake for 10 minutes. Set aside and allow to cool. Once the muffins are room temperature, poke a hole on the side of the muffin and through it. Prepare a pastry bag with a 1M tip and fill with jelly. Insert into the muffin hole and fill up with jelly. Make the glaze by beating peanut butter, powder sugar and whipping cream until creamy. Dip the tops of the muffins into the glaze. These are delicious the day they are made, but they can be refrigerated for 2-3 days. Enjoy! I just know everyone in your family is going to love these! 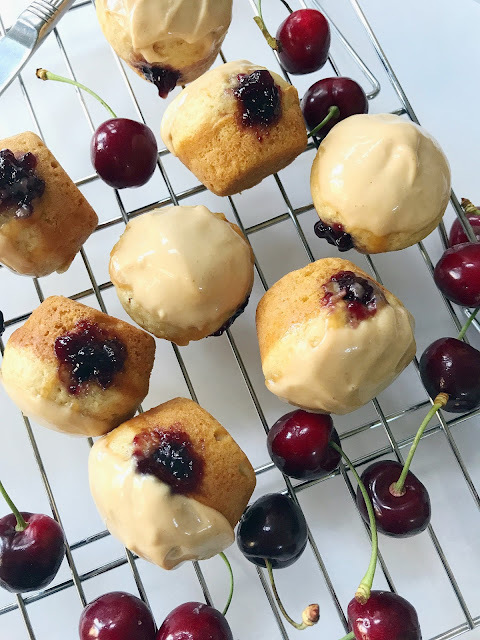 Quick bites of happy days made up of creamy peanut butter and sweet homemade jelly. Could there be anything better?